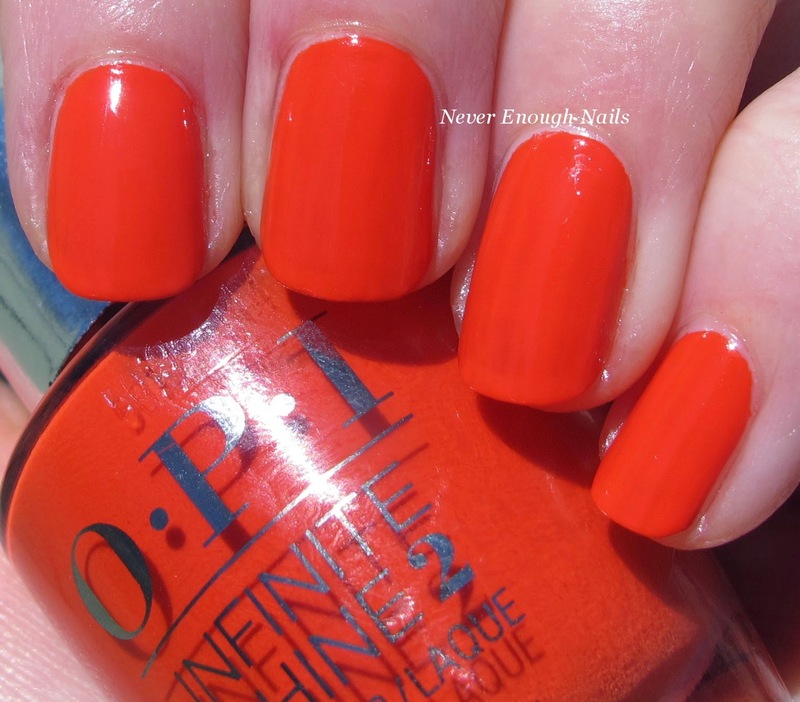 Never Enough Nails: OPI Infinite Shine Swatches and Wear Test! I've been testing the OPI Infinite Shine system for the last few days and have some preliminary results to show you as well as swatches of all of the colors I received. 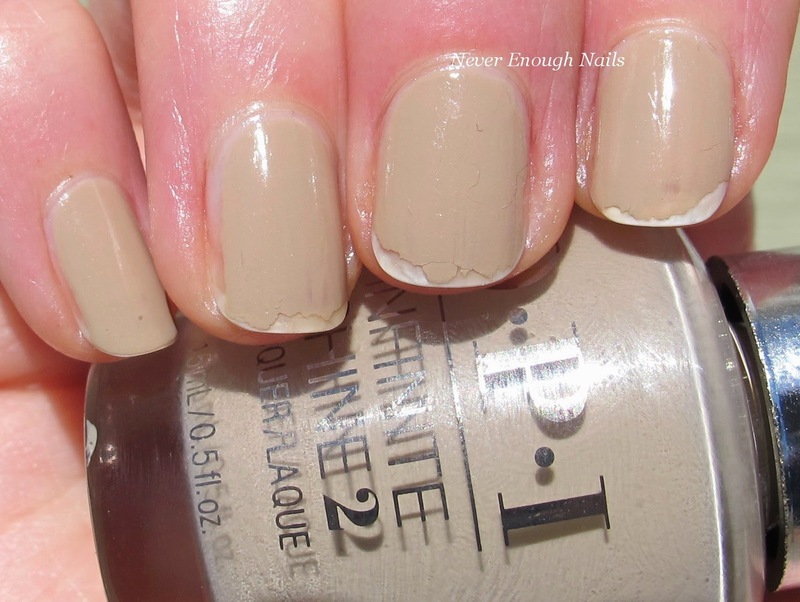 This pretty sandy neutral creme is OPI Maintaining My Sand-ity. Maintaining My Sand-ity is a pale beige neutral with some mushroom grey tones. 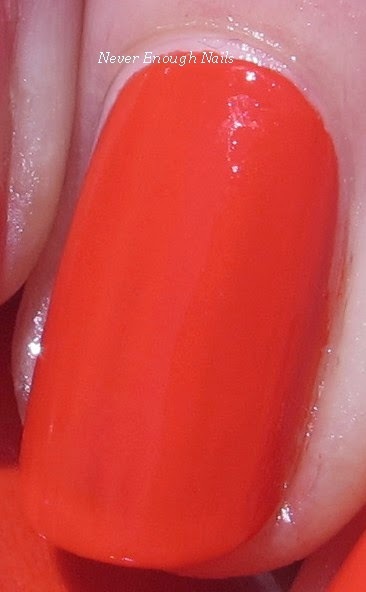 I like this color a lot, so I chose to make it one of the shades I tested for wear (read on for more info). Maintaining My Sand-ity was easy too apply. I am always a fan of the gel-like formulas, as I think they have the perfect consistency. They make it easy to put the polish right where you want it, without flooding the cuticles and with no streaks. This is two coats and it was fully opaque. The picture above were all taken a little less than a day after I applied the polish. I applied it on Thursday afternoon and took those on Friday morning. All 10 days looked perfect at that point. Below, we have a picture of my nails on Saturday afternoon, so 2 full days of wear. You can see tipwear and a bit of chipping. This is also how my right hand looked. The next two pictures are after 3 full days of wear. The first is my left hand, the second is my right (dominant) hand. My left hand isn't too bad, but the chipping on my right hand is what made me stop this wear test after 3 days. I can't stand chipping like that. For this wear test, I followed OPI's directions exactly. I applied one coat of the primer on clean nails, two coats of color, then one coat of the Gloss (top coat). I only took one shower during this time period (no judging, Friday was a busy day! I showered right after this, I swear!). And now, back to the pretty stuff! 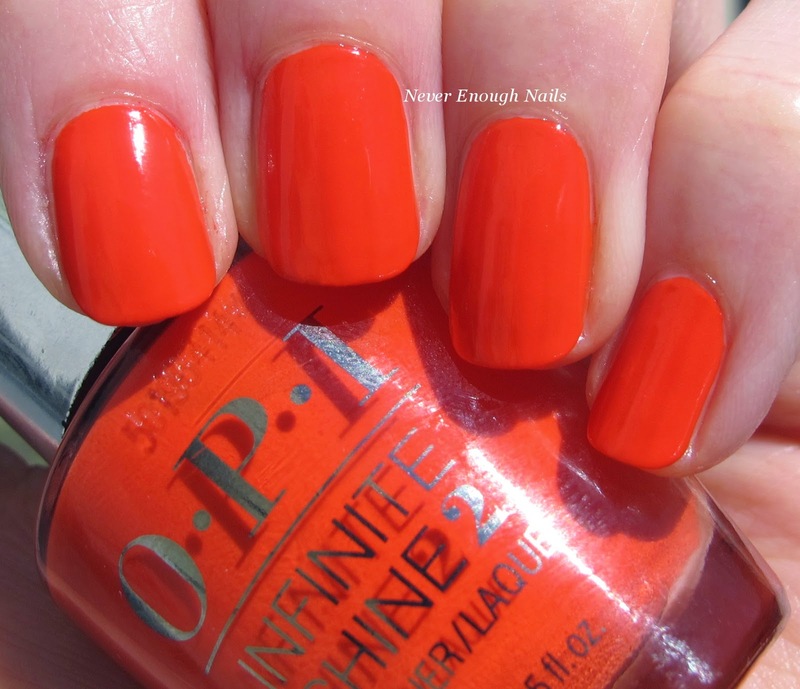 OPI No Stopping Me Now is a bright attention-getting red-orange creme. I'm a huge fan of orange and this one is perfection. It's bright, without being a true neon, and the mix of orange and red is perfect for summer. This one will be going on my toes ASAP! This is two coats of No Stopping Me Now. It was lovely to apply, one of those polishes that practically paints itself onto your nails. 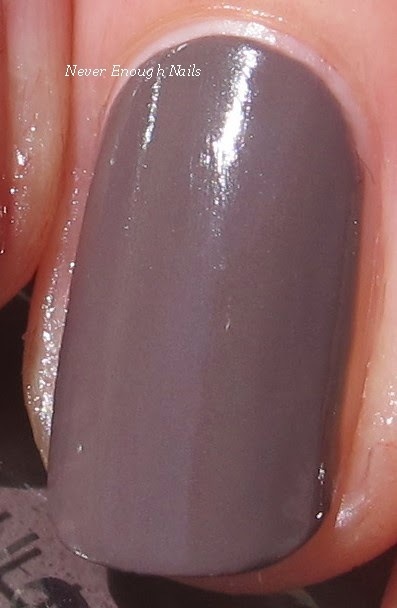 OPI Set in Stone is the Infinite Shine cousin of the beautiful purple-taupe neutral cremes OPI does so well. Set in Stone is decidedly more purple than You Don't Know Jacques, and more taupe brown, less purple, than Parlez-vous OPI?, so it's kind of a nice mix of the two. It reads like a neutral, but definitely has a nice smoky purple to it so that it's not boring. This is two coats of Set in Stone. 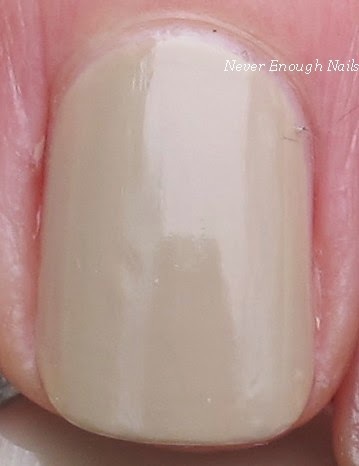 The pigmentation was good, but some of the color came off when I applied the top coat, so be careful to let the color dry most of the way before applying the Gloss. It was easy to apply though, with the same nice gel consistency. 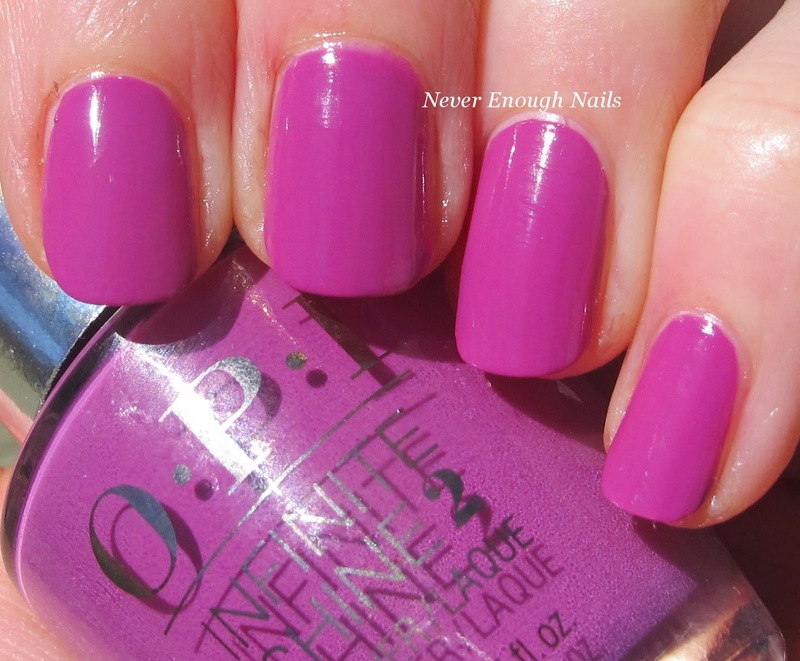 OPI Grapely Admired is probably my favorite of the OPI Infinite Shine colors I received. This is a pinky purple, almost like a more purple radiant orchid creme. It has red undertones, rather than blue like a lot of purple cremes, and I can't think of a dead on dupe in my massive purple collection. It seems a bit brighter on the nail than in the bottle, but I love the color. It's my new go-to purple creme (replacing Essie Play Date)! This is two coats of Grapely Admired. It was nicely opaque and applied perfectly. I think some of my cuticle oil got on the polish, so it doesn't look as shiny in these pictures, but it was wonderfully shiny. OPI Raisin' the Bar looks nothing like a raisin and that is A-OK with me! This is a stunning blood red squishy creme. It looks deep and vampier in darker lighting and brighter red in sunlight. It's a really drool-worthy red. As someone who hardly ever wears red, I will admit that I actually want to wear this! Topped with the ultra shiny Infinite Shine top coat, it's a stunner for sure. This is two coats of the luscious Raisin' the Bar. It has some VNL due to it's gel-like formula. I don't mind the VNL in this case, as it looks like a cherry popsicle! This, like the other Infinite Shines, was super easy to apply and was the perfect consistency. 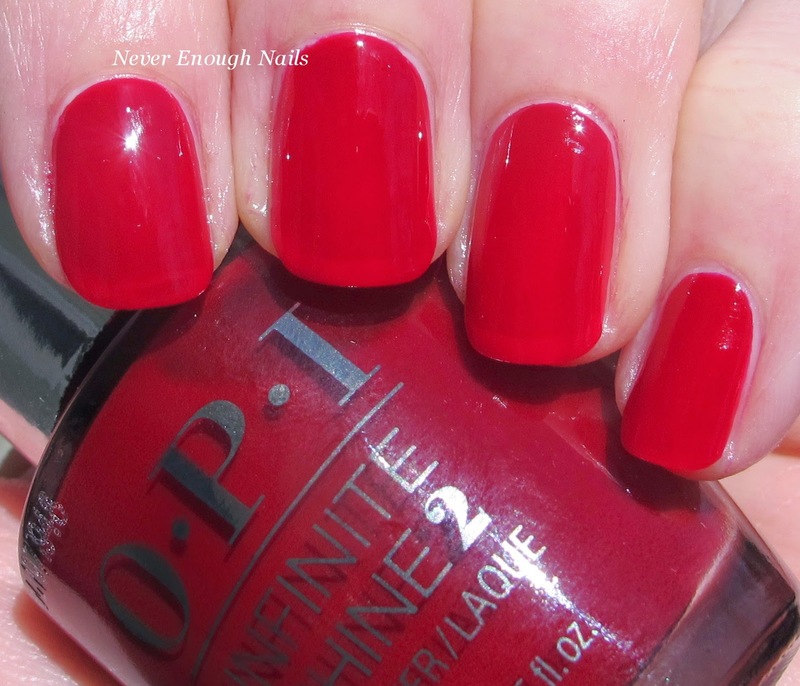 I posted OPI Running with the In-finite Crowd the other day, so you can check that out if you missed it. Here's a swatch just so that all of my Infinite Shines are in the same place! As I mentioned, I will be testing the Infinite Shines more thoroughly and will update you about the results. After my first two tests, I would recommend that you purchase these if you love the colors and the beautiful shine. The line really has a lot of gorgeous colors (I plan on purchasing two of the blues and another purple) and the shine from the top coat can't be beat. If you're looking for 10 day wear, I'm not sure it's going to happen here. These seem to wear similarly to regular polish for me. Stay tuned for swatches of the three other colors I'm going to buy! The OPI Infinite Shine Gel Effects Lacquer System is available now at professional salons, including Ulta, ulta.com and beautybrands.com.